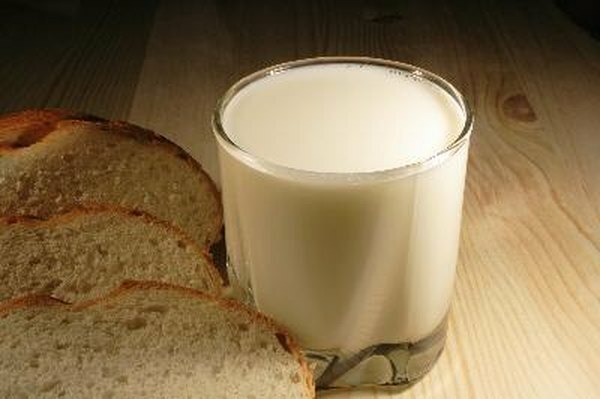 Gluten and lactose are common allergens that cause digestive disturbances and health concerns for many people. Gluten is the protein found in wheat, barley, rye and cross-contaminated oats. People with celiac disease must avoid gluten entirely as it attacks the villi lining the intestinal walls, leading to malabsorption of nutrients. Lactose is a protein found in dairy products including milk, cheese and yogurts. Many people have intolerances to both of these proteins, leading to symptoms such as diarrhea, constipation, bloating and lethargy. A gluten- and lactose-free diet aids in alleviating these symptoms. A gluten- and lactose-free diet should contain healthy complex carbohydrates like those in gluten-free grains. Complex carbs provide energy and are a source of dietary fiber, which is essential for the smooth regulation of digestive processes. Fiber also fills you up, helping to keep you feeling satiated. Healthy gluten-free grains include brown rice, wild rice, quinoa, buckwheat, millet and amaranth. Look for breads or products made with these alternative flours; avoid anything made with wheat, rye or barley as well as foods that have hidden gluten ingredients. Avoid dairy products that contain lactose in favor of lactose-free alternatives. Many milk companies produce lactose-free milk. Alternatively, you could take an enzyme supplement that breaks down lactose to avoid any digestive upsets. Also available are other non-dairy milk products that are free of common allergens including lactose; examples are almond, soy, rice and hemp milk. These nuts and grains are also often used to make cheeses and yogurt, and most are gluten free. Read labels carefully to discern what ingredients are present. Fruits and vegetables should be the foundation of your gluten-free and lactose-free diet. Produce contains neither of these proteins, is low in calories, has little to no fat and has no added sugars. Fruits and vegetables are rich in nutrients, vitamins and minerals that are essential for normal body functions, hormonal balance and skin health. They are also a source of dietary fiber, which alleviates digestive conditions such as constipation or bloating by pushing food through the digestive tract for elimination. Include a variety of fruits and vegetables in your meal plan, and aim for five to 10 servings within meals and snacks. Processed foods are stripped of their nutrients during the refining process and should be avoided on any healthy diet, including a gluten- and lactose-free diet. These foods are typically high in calories, sugar and fat and contain either allergenic gluten or lactose or both. Avoid packaged, boxed and canned foods such as granola bars, candy, chocolate bars, cookies, cakes, soups and beans. Although it may not be obvious that these products contain gluten or dairy, many do. Read labels carefully and check for labels certifying the product is gluten or lactose free.